Break Rules, Clean Up Gutters — The To-Do List Of The Rookie Mayor In Sierra Leone's Capital : Goats and Soda Yvonne Aki-Sawyerr, the first female mayor in Freetown in years, is trying to clean up the perpetual mess caused by rain and garbage — a first step in her plan to revive the beleaguered city. Yvonne Aki-Sawyerr, the new mayor of Freetown in Sierra Leone, speaks at the 2018 Concordia Annual Summit in New York City. "For decades, there had been no structure, no focused thinking of a strategy for the city," she says. "The way my brain works is with plans. I have to have a to-do list." Yvonne Aki-Sawyerr walks up the stairs from her office in Freetown, Sierra Leone, to her car when she notices that the sky has darkened and is starting to open up. Tiny drops of rain fall. Within seconds they've become large and squishy, splashing against the concrete – and she has forgotten her rain boots. Her hot pink slingbacks won't make it through a downpour. Aki-Sawyerr, who was elected mayor of Freetown in May and is the city's first female mayor in nearly 40 years, asks her driver to take a detour on the way to an outdoor meeting with market women. She is hoping to find a street vendor selling rubber sandals. As the car weaves through sheets of rain, she spots overflowing gutters and makes frantic calls to members of her team back in the office. "Have you seen this spot?" she asks. "We're near Victoria Park. Everything is flooding. Have we noted this?" Aki-Sawyerr, 50, is obsessed with garbage, rain and the intersection of the two in Freetown. The city is the capital of Sierra Leone, a small West African country that is ranked 184 out of 189 on the U.N.'s Human Development Index, meaning it has some of the worst health, economic and social indicators of any country in the world. Freetown is beautiful — and chaotic. Its inhabitants are slammed between rolling green hills and the Atlantic Ocean. During the country's nearly decade-long civil war, which ran from 1991 to 2002, people from Sierra Leone's hinterlands fled to the seaside capital for shelter and services. In the war's aftermath, the migration continued, as people looked for jobs in a perpetually weak economy. As Freetown has grown, it has increasingly been characterized by densely packed neighborhoods composed of tiny tin-roofed homes that sit in precarious places, such as on the sides of Freetown's hills or along the ocean. The country's six-month-long rainy season, mixed with a barely functioning waste collection system and overcrowded streets, annually creates disasters of differing magnitudes. The city, home to 1.5 million of the country's 7.5 million people, made headlines in August 2017 when a landslide killed more than 1,000 people. Flash floods regularly close shops; vehicles get stuck navigating the city's washed-out and potholed streets; and trash gets flushed from cluttered roadside gutters into people's homes. One poor seaside settlement, Kroo Bay, has flooded every year since 2008. Cholera is an annual threat, especially in poor neighborhoods that are most likely to be overcrowded and least likely to have any sanitation system to speak of. The August 2017 landslide was a wake-up call for the country. It was attributed to not only torrential rains but a mix of overcrowding, poor public infrastructure, little oversight of rapid new construction in environmentally sensitive areas, and deforestation. After the disaster, the government realized that not only human lives were at stake. Even big donors like the International Monetary Fund saw Sierra Leone's fragile environment as a potential damper on the country's already anemic economy. Aki-Sawyerr says she made the decision to run for mayor after overseeing Operation Clean Freetown, a government effort that was part of a large post-Ebola recovery program that started in 2016. The project aimed to "[reduce] the risk of epidemics by improving solid waste management in the city." "I came face to face with how bad things were" in Freetown, Aki-Sawyerr explains over a late breakfast of boiled cassava root after returning to her office from her meeting. "I decided I had to run." She expanded this work as mayor. Her first task in office was to identify the locations with the most egregiously clogged gutters that were missed in Operation Clean Freetown and have them cleared. Plastic, dead animals, medical waste and food were removed so water could flow. But clearing up gutters was just a first step. Aki-Sawyerr aims to build a functioning waste collection system, rather than having the majority of Freetown's residents simply dispose of waste wherever they can — on the side of the road or in piles around their neighborhoods. 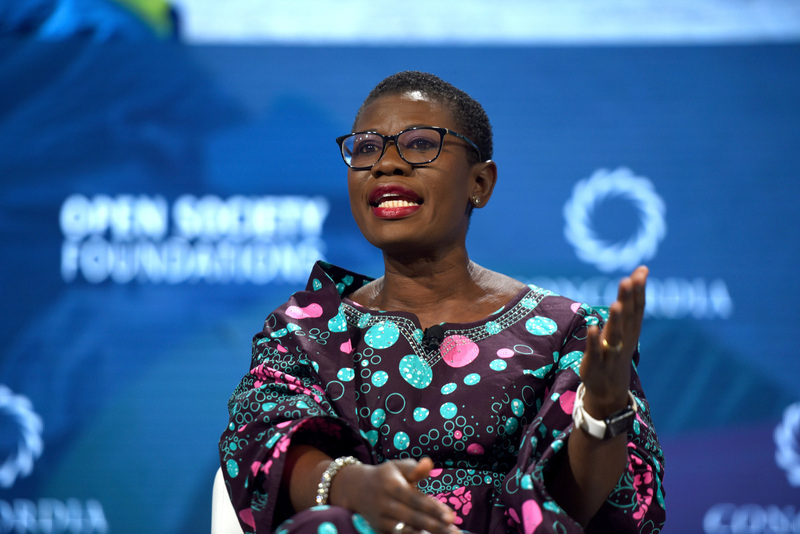 She also aims to increase access to toilets, an ambitious goal given that only 13 percent of Sierra Leoneans have access to clean, safe facilities, according to the World Health Organization. And she wants to promote tourism. "We live in one of the most beautiful cities in the world," she says from her office, which looks out over the Atlantic Ocean and sits in a historic 19th century building in the middle of the city's aging downtown. "People should be coming here, not trying to leave." She has other goals, too, ranging from increasing access to education to licensing street vendors so that they trade in official markets and not on the city's crowded alleyways. "For decades, there had been no structure, no focused thinking of a strategy for the city," she says. "But the way my brain works is with plans. I need to know where I'm going. I have to have a to-do list." Aki-Sawyerr is familiar with Freetown's dysfunction, having grown up in the thick of it. She was born just after Sierra Leone gained independence from the British and a year after Siaka Stevens became prime minister. His nearly 20-year rule would become known for corruption and mismanagement, gutting the country's public institutions and ultimately plunging the country into war. After graduating from the country's top university, Fourah Bay College, in 1988, Aki-Sawyerr moved to England on a Commonwealth Scholarship to study at the London School of Economics. She then worked as an accountant, met her husband and had two children. Aki-Sawyerr always made regular trips to Sierra Leone to visit her parents and siblings and started going home more frequently during the Ebola outbreak. Using the business know-how she gained in the U.K.'s private sector, she took a leadership position with the National Ebola Response Center in January 2015, overseeing the country's response and facilitating coordination between the government, donors and dozens of NGOs. She left as the outbreak waned but again returned to Sierra Leone in January 2016, just after the epidemic ended, to supervise implementation of the country's post-Ebola recovery. She gained a reputation for requiring detailed weekly progress updates. She also helped manage relationships with government donors, using her skills as an accountant to track finances and project needs. And now she has Freetown in its entirety to oversee. Aki-Sawyerr says she conducted the Freetown cleanup within weeks of taking office in part "to demonstrate that something can happen. We need to get people believing in the city." The city was essentially broke when Aki-Sawyerr took office in May, a result of tax codes that hadn't been updated for decades and poor tax collection efforts. The annual budget of Freetown has been about $4 million. With little revenue coming in, after salaries for the city's employees are paid, there's not much left for anything else. Aki-Sawyerr is aiming to find ways to boost coffers. She not only hopes to update tax codes but wants to introduce new revenue generation schemes, such as parking fees. She has also instituted mobile payment for local taxes and is soliciting money from private companies for specific projects. She can't determine how money is spent, though — that's up to the Freetown City Council, an elected body that oversees the city's day-to-day finances and functioning. She hopes that input from Freetown's citizens will guide the council's decision-making process. In the months after her election, she has hosted 48 town hall meetings and considered data collected from 310 community needs assessments about the priorities of Freetown citizens. "I learned during Ebola that 'community sensitization' doesn't mean telling the community what to do but really listening to their concerns." And there is a lot to consider: complaints about all levels of public services, from lack of markets to traffic problems to limited recreational facilities. She has set up working groups to take action on the complaints. "You need a process for everything," Aki-Sawyerr explains. Aki-Sawyerr's no-nonsense, results-driven approach makes her stand out. And some Freetown City Council members have turned up their noses at the team she has brought in: well-dressed young people who type on Excel spreadsheets, talk through ideas with the help of brightly colored sticky notes posted on whiteboards and answer a slew of text and WhatsApp messages and phone calls in a bustling corner of her mayoral suite. The staffers are a mix of Sierra Leoneans and expats. Some are from the African diaspora and, like Aki-Sawyerr herself, had once sought more competitive private sector jobs in the U.K. Some team members have been hired directly by Aki-Sawyerr; some are volunteering for the new mayor. And some are supported by the Tony Blair Institute for Global Change, which is known for helping to staff high-level government offices but made an exception for Aki-Sawyerr. "Whilst we typically work at the presidential level it was a unique opportunity to dive into local government when Yvonne was elected," says Emily Stanger Sfeile, the Sierra Leone country head for the institute. Aki-Sawyerr knows that she is perceived as different and is sensitive to what her years in the U.K. can signify in a country with a recent colonial past and limited travel opportunities for the vast majority of its citizens. She says she has been made fun of for speaking "the Queen's English" and called "an outsider." She was also physically attacked weeks after taking office, although the reasons are not clear. There had been some violence prior to the election, with politicians targeted. But she isn't apologetic. At a meeting with other local officials — mainly men in sleek suits — she lets her colleagues know she won't be pushed around. When a high-level minister notes that a new budget from the government should be out by Friday, Aki-Sawyerr responds, "then we'll expect the money by Monday." Everyone laughs. She doesn't. And so far, she does seem to be popular. Paul Conteh, a lecturer at Fourah Bay College, says that Aki-Sawyerr isn't "showing loyalty so much to her political party, but rather to Freetown. As a result, people respect her." On the way to her early morning meeting, she was peppered with exuberant shouts of "Mayor! Mayor!" as she trekked through soggy city streets. A young man standing under an awning whispered to his friend: "You know who that is?! That's Ms. Aki-Sawyerr!"